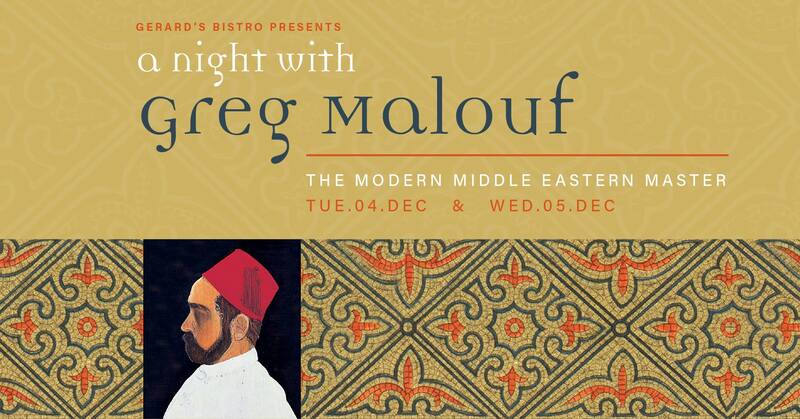 Greg Malouf has inspired a generation of young chefs and transformed the Australian and international restaurant scene with his love for the flavours of the Middle East and North Africa. Greg’s reputation as the creator of a new style of cooking known as Modern Middle Eastern, combining Middle Eastern tradition with contemporary flair reaches far beyond his native Australia. Greg was born in Melbourne, the son of Lebanese parents. After serving his formal apprenticeship in several of Australia’s finest restaurants, he went on to work in France, Italy, Austria and Hong Kong. In 2012, Greg left the award-winning restaurant MoMo (Melbourne) to take over the reigns at the iconic Petersham Nurseries Cafe in Richmond, UK, where his Middle Eastern take on seasonal dining earned the restaurant a Michelin star. Greg has produced nine beautiful and award-winning books with writing partner Lucy Malouf on different cuisines, starting with Arabesque in 1999. In 2011, he was honoured as Ambassador by The American University in Beirut for his achievements in promoting Lebanese cuisine around the world. Greg is in constant demand around Australia and abroad for chef master classes, media interviews and guest-chef appearances. It is with great pleasure that we invite you to join us for an experience like no other as Greg Malouf takes over the kitchen at Gerard’s Bistro. Enjoy a modern Middle Eastern feast prepared by Greg himself, and hosted by Gerard’s Bistro owner Johnny Moubarak. Tickets are limited. For more info email: info@gerardsbistro.com.au or call: (07) 3852 3822. Cost / $160 per person. Tickets Limited.